We deliver cost-effective and desired results by using the most advanced technology available, reinforced by traditional treatments for the comfort and satisfaction of each patient. Gentle but effective dental care is the top priority of our hygiene department. Comfortable, durable and cost-effective crowns in less than a few hours. Improve your smile with professional veneers, filling replacement, whitening and invisible braces. Natural-looking tooth replacements improve your appearance and help you enjoy your favorite foods again! Ask us about adding a BOTOX Cosmetic treatment to your dental appointment, so you can look as young as you feel! Know you need braces, but don’t want to go through the hassle? Artistic Dentistry now offers “Six Month Smiles,” a virtually clear form of cosmetic braces that will straighten out your smile in no time at roughly 60% of the cost of regular braces! Call us to find out how easy & affordable your new 6-month smile will be! Artistic Dentistry now offers “Single Visit Crown” treatments that employ new & advanced polymer technology to have you in & out in one single visit. If you’ve been putting off replacing that crown for way too long because you simply haven’t had the time, now you can have it replaced in one single, easy visit and be treated like the king or queen that you are. Call to schedule your appointment and get the royal treatment you deserve! Ready to get your smile on? After an easy breezy KöR Whitening treatment from Artistic Dentistry, your teeth will have such a fresh, natural whiteness, it’ll really give you something to smile about! Call Artistic Dentistry today and find out how easy and affordable our KöR Whitening treatment can be for you! 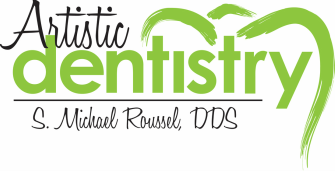 Dr. Roussel employs a full-time hygienist certified by the State of Louisiana to administer local anesthetic agents and to place dental sealants and fluorides, as well as other adjunctive dental procedures such as root planning and scaling—a nonsurgical method used to control periodontal disease. Gentle but effective dental care is the top priority of out hygiene department. We make this possible by using advanced dental technologies such as ultrasonic instruments and laser cavity detection along with a gentle touch. Learn more about dental cleanings. hygienists are trained to provide this service to reduce the incidence of tooth decay in your child. Dr. Roussel uses dental bonding to sculpt individual teeth with a special tooth-like material that looks, acts and feels like the real thing. This is a tooth-conserving way to close unsightly gaps or brighten that not-so-white smile. natural-looking tooth replacements that can improve your appearance and help you enjoy your favorite foods again. He uses today's latest materials for the most natural look possible. From replacing a single tooth to securing a full denture, dental implants are an effective alternative that can help you have a strong, life-like feel to your teeth. These dental implants are like a second chance at having natural teeth and we guarantee you will feel confident chewing gum or even biting into an apple. These durable tooth replacements allow you to close gaps from missing teeth or anchor custom-fit dentures and partials for unsurpassed stability and comfort. These revolutionary implants can be placed in as little as one hour and can give you the secure, confident smile you've been dreaming of for a long time. In addition, mini implants replace conventional implant surgery and are quite affordable. Dr. Roussel’s natural-look fillings will match the color of your existing teeth for aesthetically pleasing results. restorations. There's a huge difference between metal fillings and our new porcelain restorations that reflect the translucence of natural teeth. Your new tooth-colored fillings won't show wear or cause opposing teeth to erode, and it costs a lot less than you think! Gum disease is today’s leading cause of tooth loss. Thankfully, Dr. Roussel can treat it without surgery. He offers scaling, root planning and Rx medications to keep your smile healthy for a lifetime. Calling upon his years of experience with the intricacies of this effective cosmetic process, Dr. Roussel can create a beautiful smile that will last a lifetime. Have you noticed more and more "older" smiles are becoming whiter and whiter? Now we can brighten your smile too with powerful whitening treatments that lighten discolorations caused by coffee, cigarettes, medication, or aging. You'll notice the difference immediately...and so will everyone else. We will custom fit you for a tray containing whitening gel quickly and easily in your initial visit, and then you continue treatments at home until your teeth are as bright as you desire. It's as easy as that! regular cleaning appointments twice a year and get your whitening gel supply for free.